How Can Something So Tiny Be So Complex? Why Is This Impossible for Evolution? What did it take for atheist Alfred Russel Wallace to switch to a belief in a Creator? Answer: his examination of the complexity of the brain convinced him. What did it take Scott Minnich, Molecular Biologist at the University of Idaho, to give up atheistic evolution in favor of Michael Behe’s idea of Intelligent Design? Answer- his twenty years of study of the bacterial flagellum motor. This is tiny, for to study it, the bacteria must be magnified 50,000 times. Yet it has forty protein parts that must function together to make it work so marvelously. The flagellum motor whirls at a rate of 100,000 rpm and can stop and reverse direction in a quarter turn! Scott Minnich’s studies led him to state that this is the most efficient machine in the universe. It is water-cooled, has a driveshaft, propeller, and other components similar to those of a man-made motor. The reason this convinced him of design is based on Darwin’s own statements. Natural selection, by definition, demands that the selected trait is useful. If it is not, then it would disappear. Yet this motor has forty parts and all must be present for it to function as it does. If one part evolved but was not useful, it would be lost before all the parts came together in such an efficient, orderly way. In Origin of Species, Darwin stated, “If it could be demonstrated that any complex organ existed which could not possibly have been formed by numerous, successive slight modifications, my theory would absolutely break down.” Scott Minnich accepted this statement as true, and, therefore, has rejected it in favor of Intelligent Design. For those critical of mixing religion and science, note that Scott says nothing about God or faith or the Bible in his conclusion. He simply honestly looked at the evidence and said there was no way the propeller on a bacterial flagellum could have come together by a series of mindless accidents. 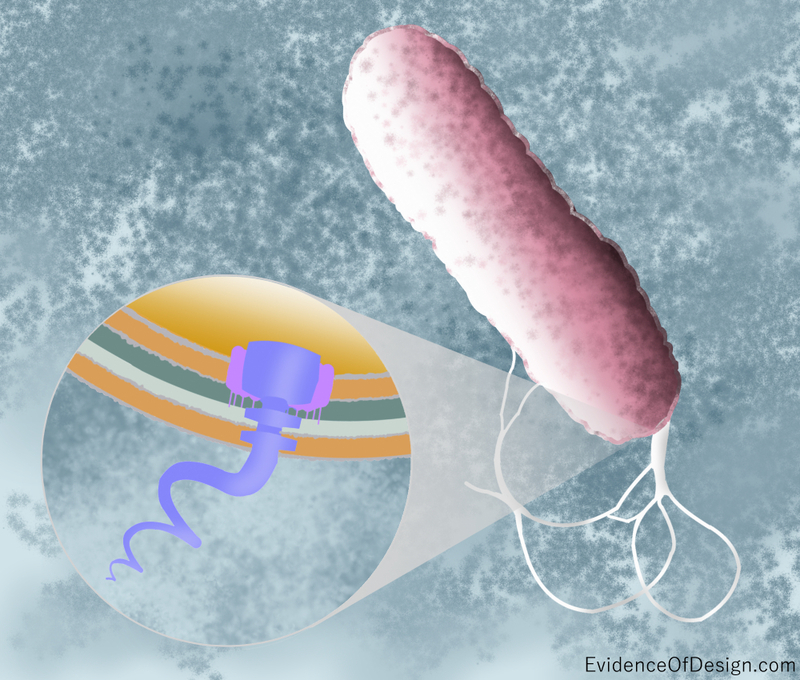 A model exists for evolution of flagella. Complexity of the brain is probably the easiest explained evolutionary facts, and is very obvious by the fact that ants and smaller organisms have simple nervous systems, larger animals like lemmings have slightly more complex clusters of nerves- brains, while humans have massive clusters of nerves and synapses. Mathematically, this is equivalent to saying, if for all possible paths of evolution, no such path results in feature x, then theory y has a flaw. Somehow I don’t think these two moronic atheist’s inability to find a possible path means that no such possible path exists. Since there are uncountably infinite many paths, thats a lot of paths to go through and say do not work. The death knell to macroevolution as a plausible explanation for the origin of life sounds in the summary points in three articles entitled, The Bottom Line in Debate of Design, which you can search for. The overwhelming witness of all of these points together is, in my view, conclusive. So is the article cited supposed to prove the development of bacterial flagellum motors is easily explained? A man who studies something for 15 years and finds it mind boggling to explain it by a series of random processes says more to me than a brief and poorly referenced article. /Not easily explained, just possibly explained. The explanations need not be probable, just valid paths, as explained in my next comment. Evolution claims that species x evolved by a path of mutations according to the method of evolution. Creation claims that species x appeared because god made it. You claim that no path of mutations following the evolutionary methods could generate species X. Thus logically, evolution would be false. However, it has been shown that a path of mutations exists following the evolutionary methods that could generate species X. Thus you’re claim is not true. This neither shows evolution nor creation true, it just shows your statements false. Before you go and continue making statements that simply are not logically valid, read at least one whole article from each section, and verify that you understand it by doing example problems. Logic is a required understanding to make any true statement. Also, evolution teaches that life should be becoming better on earth as we “adapt”, that there should be more and more species as time goes on. BUT ALL SCIENCE PROVES THAT THERE ARE LESS AND LESS. Why are animals going extinct? Shouldn’t they just evolve into something to help them survive? Now I’ll bring you back to the origin of evolution. Darwin observed the birds with different beaks, right? And he concludes that this happened so they could adapt to their surroundings (lets say there was a drought) better and thinks ‘OH! Evolution!’ But what he failed to see was that the birds were like this because of natural selection for the time being, and the common beak was still present. As the surroundings changed back (the normal climate returned, the drought ended) the common beak became the dominate beak again. Instead of retaining the change and continuing to evolve, the birds that had beaks that survived better in a drought became the subordinate in the speci once the common-beaked birds were able to survive better and reproduce more. MACROEVOLUTION evolutionary changes that happen over very long periods of time. This usually refers to the development of large new branches of life, such as vertebrates or mammals. The small changes do not add up, macro-evolution does not exist, though I do believe in micro-evolution. Finally, just remember to ask yourself where the original material came from, since matter can’t be created or destroyed.